Visio includes in the box several stencils with objects drawn in an isometric style. Wikipedia has an excellent overview of the isometric projection technique if you are interested. The appeal of isometric is that it’s much easier to draw than perspective since distance of the object from the eye is not considered. An object at the front of a room drawn in isometric will be the same size as an identical object located at the back of the room but the view shows 3 dimensions. The adjacent illustration shows the angles of the Isometric X and Y axes with the Z axis pointing up. 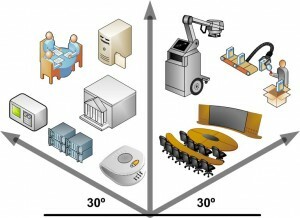 The illustration has no scale… the objects are samples from Visio and Visimation stencils drawn in isometric simply to show a variety. 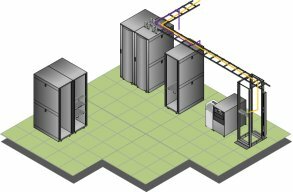 In a similar style, we created a custom set of scaled isometric shapes for Tripp Lite products including equipment racks, enclosures, power strips, and power distribution units. A sample is at the top of this page. These stencils are available for free download from ShapeSource.com. In a future article I’ll cover the differences in behavior of the various types of Visio connection points for 1D and 2D glue that can ease the process of assembling a set of parts. I previously discussed 1D glue for mounting devices in racks, for example, and we’ll revisit that here as we place devices into the enclosed racks in a simulated 3D isometric view. Since Visio is a 2D system, it has no way of knowing that an object is physically contained by another object in 3D space. We need to trick these shapes into showing the devices inside of the enclosure. Drag a device (in this case a PDU) and drop it in the enclosure. Note the dark box that appears around the enclosure. This signals that the enclosure shape is a group that will accept dropped shapes into it which is a setting in the Format > Behavior dialog box. For this to work, the dropped shape must also have a special behavior set, “Add shape to groups on drop”, in the same Behavior dialog box. The shapes in this stencil have been preset with these options. If you zoom in closely you can move the PDU until it’s snapped into the rack with 1D glue. Visio can be a bit finicky under these conditions so zoom in close to see the shape handles and the red glue indicators. Right click on the side panel and select Shape > Bring to front. The side panel now covers the PDU and the PDU appears to be within the enclosure. Note that the enclosure is a group that’s structured so that when you click on the side panel, that portion of the enclosure comes to the “front” while leaving the remainder of the enclosure “behind” the PDU. At the right is a close-up of the PDU before and after the enclosure side was brought forward. You’ll need to work with these shapes a little to understand how to manipulate them to achieve the desired 3D results. Of course, this is only a problem when you are trying to place an object within the 3D envelope of another object. It’s much easier to work with the free standing racks and enclosures and especially (on the Tripp Lite isometric stencil) the SRCOOL12K cooling unit and the SU20K3/3 power unit. With these objects, the last one dropped will always be “on top”. If you move objects around you may need to bring certain ones forward with right click menu I mentioned above or the Shape > Order menu from the main menu bar. I hope this brings the subject of Visio 3D simulation a bit more into <ahem>… perspective.